Here I want go deeper into the idea of identifying and addressing weak links toward making permaculture stronger. This idea is the seed of this entire project. Best we are as clear as we can be about what it is and what it is not. Before we start, however, I want to make a confession. I am a recovering academic. I have been clean as a whistle for over ten years now. Honest. Practicing permaculture has been critical to my recovery. From the clouds of high abstraction I have been threading myself back into reality one sweet design process at a time. One barrow load of soil, one grafted tree, one pond, or drain, or driveway. Chicken therapy has been invaluable and one time I had a most productive session with a duck. We bonded over soup. But I feel a serious relapse coming on. I ask for your support in helping me through this bout of wrangling trains of thoughts into sequences of sentences. In my next post I’m even going to have footnotes and a consistently formatted list of references, for crying out loud! Trust me, I know how risky this is. But it is a risk I’m prepared to take. Because I believe and I feel, in my heart of hearts, that at this juncture a dose of theory will add real value to Making Permaculture Stronger (MPS). I feel it is important that the starting assumptions of MPS are publicly shared and critiqued and discussed up front by at least some of us. But I also appreciate that this stuff is not for everyone, and that many of you will be more interested in what’s in the pipeline in terms of practical permaculture applications. If so, all good and see you down the line! If, per chance you are in to this setting-the-foundations-of-the-approach business, then equally all good, and please don’t hold back in your constructive commentaries and offers of collaboration in getting what I think is this important and timely work off to the best possible start. I also encourage you to let me know when enough wrangling has been done for one sitting and it is time to come back down to the sweet brown earth and see what difference the ideas we develop together make on the ground – the only place it counts. 1. Along with many others, I want to help make permaculture stronger. 2. The best way I know to make something stronger is to identify and strengthen its weakest link. Until it stops being the weakest link at which point you move on to the new weakest link. And so on. 3. Before you can identify a weak link you must identify a link. In other words, to identify permaculture’s currently weakest link, you must first have a feel for permaculture’s links, period. Then, once the links are on the table, you can inquire into whether they are weak, neutral, strong, or otherwise. 4. Permaculture’s key links, aspects, areas, stepping stones, or whatever you want to call them, exist as a pattern of dependencies, where some are more superficial in the sense that they depend on and follow from others, which are thus deeper in the sense of earlier and more foundational. 5. It would be premature and counterproductive to try and create too detailed of a map of these links and dependencies, or nodes and connections. What we need to keep moving is a preliminary, tentative, provisional map we can agree on as a evolving draft and then put to work trying out the weak link approach to see if it is worth the effort. If it yields fruit, then great – we can go back, revisit, refine, and try out different ways of going about mapping things. The idea is that growing up from a foundation in ecological/pattern literacy, systems thinking, a wholistic approach or worldview, the three core ethics, fundamental assumptions, the seminal definitions of permaculture, and the design principles (all these being general foundations that apply everywhere & always) permaculture travels via sound design process to sound and situation-specific design configurations or patterns along with their component strategies and techniques (all three being in the specific solutions category). In this diagram, sound design process is the tree trunk. If you’re a bit of water or mineral in the roots and you’re heading for the leaves, you got to go through the truck, capiche? Put another way, this way of mapping things appeals to me in that it makes it unmistakably clear that design process has a uniquely critical role in translating permaculture’s beginnings and foundations into the on-the-ground solutions it is reputedly renowned for. As established in two previous posts, it is the only valid pathway from the general to the specific. Please do comment on any major flaws you see in this organising heuristic, but at the same time please tolerate any minor issues and humour me while I run with this as a guide into seeking out and then attempting to strengthen weak links in permaculture. Starting with my very next post. 8. Okay, moving right along. I hope this new diagram makes it obvious that it makes more sense to find and tackle any links that are weak in the root and trunk regions first, as opposed to heading straight for the canopy where we are effectively dabbling in the amelioration of symptoms. Addressing foundational weak links will then in theory flow through and address or remove the weak links that depend on it and follow from them. This is leverage at work and it just makes sense. It is using a systems approach to improve a systems approach. 9. If we can agree it makes most sense to start below the canopy, then we still have some options. I’m looking forward to considering all permaculture’s foundations in due course. If we want permaculture to be as strong and challenge-ready as it possibly can be, I don’t see why we should leave any stone unturned, or for that matter any turn unstoned. But right now my gut feeling is that the foundations are not critically weak (what is your feeling?). Not so with the trunk. Not so with sound permaculture design process. Whether it is a weak link because our core understandings of it are flawed, or whether it is simply suffering from neglect, there is no doubt that something is wrong here. Indeed the image I get is of a huge oak tree teetering on a feeble little stem. A stem with an open wound succumbing to a fungal infection or something. A stem about to topple because it is too thin to support the enormous and growing canopy above it. Continuing only to strengthen and grow more limbs, branches, twigs, leaves and so on in this scenario is just not that clever. Not when the trunk is weak and crying out for attention, for sap flow, for healing growth. Take the endless debate and quibbling about permaculture’s weak link of cookie cutter solutions whereby certain strategies and techniques are inappropriately imposed left, right and centre. Whether it is debating the relative merits of this strategy or that technique. Whether it’s commissioning research on whether this strategy or that technique is appropriate in temperate climates. Or whatever (funny, I just can’t bring myself to mention any of these cliches I’m alluding to. We all know what they are, right?). Applying the foregoing logic we ask is there an underlying weak link responsible for this issue? I believe there is. I believe this entire issue is a more superficial flow-on effect of the deeper weak link of a lack of appreciation for, agreement on, and widespread use of, sound design process. For the only sure indicator as to the appropriateness of this strategy or that technique in a given context is: does it come out of the application of a sound design process? The tantalising implication is that if we could address the underlying root (or in this in this case trunk ;-)) cause then the more superficial issue would disappear in a puff of sound process. Not only would permaculture be stronger, but many of us would have freed up resources to focus our energies where it counts (the next foundational weak link), rather than distracting each other with more counter-productive quibbling about prematurely imposed solutions. Imagine if together, as a growing community, we collaboratively direct energy at addressing the logically prior and more foundational weak links first. Just like we most effectively address erosion by starting right at the top of the catchment. I cannot describe the excitement I feel at where the global permaculture movement would be a year from now if we were to get stuck into this together. In my next post, I’m going to make a start. Hope to see you again then. Thing One – after this map arose for me this morning (and what I thought would be a ten-minute sketching session turned into a two-hour sketching session!) 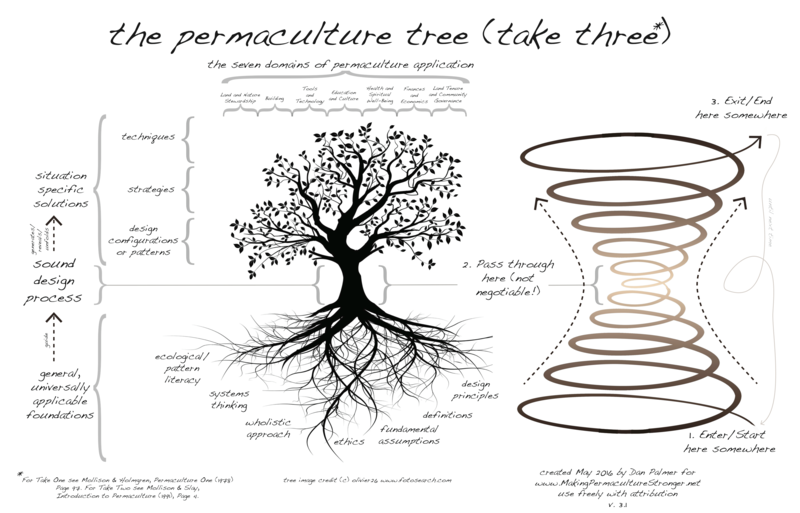 I googled “permaculture tree” and was delighted to be reminded of the diagrams under the same name in Mollison & Holmgren’s Permaculture One (1978 – hence Take One) and Mollison & Slay’s Introduction to Permaculture (1991, hence Take Two). Both share some similarities with my sketch and with each other, but all three differ in important ways too, as I’ll likely touch on in future posts. But I was stoked to rediscover (or unconsciously repeat as I had seen both diagrams before) that the founders have already been wandering through similar parts of the landscape of ideas about this stuff. 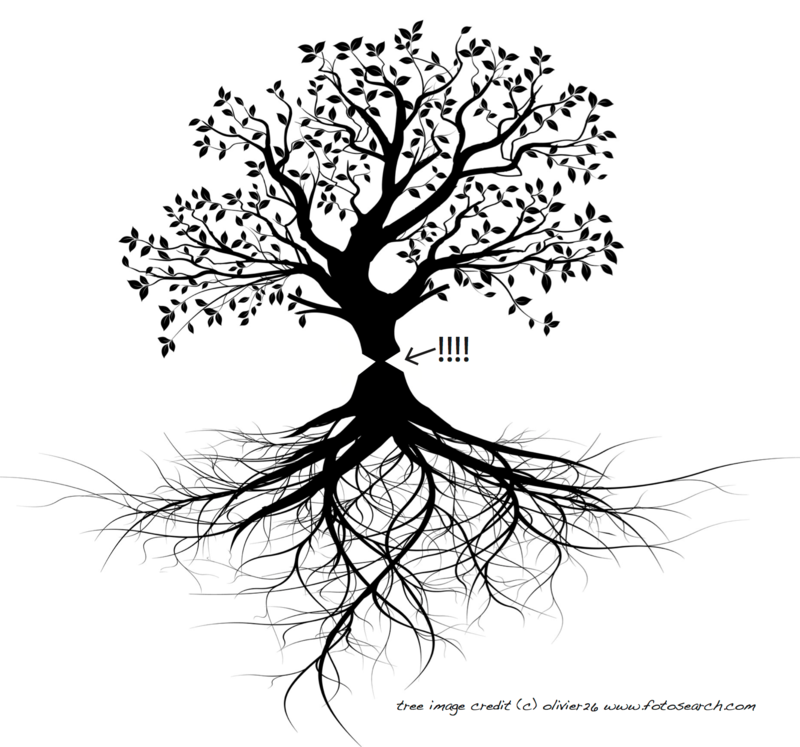 Thing Three – I want to make it clear that the sketch The Permaculture Tree (Take Three) I’ve developed for this post is true but oh so very partial. I created it to support a line of thought and to try and provide a rationale for where this project is headed next. Please don’t take it too seriously! In particular the tree analogy is only useful to a point – I’m sure that if we were to rigorously map the dependencies amongst permaculture’s nodal ideas we’d end up with a semi-lattice rather than a tree. Thing Four – Thanks to James Andrews, Adam Grubb, and Amanda Cuyler for their supportive feedback on a draft of this post. They identified some weak links and thereby helped make the post stronger. Greetings Mark and thanks for an insightful comment. I think you are right on and that ultimately if design process is going deliver the goods (in the sense of helping create a future with a future) that it can’t happen without us collectively breathing into a new story in the worldview sense, part of which is letting go of separation and the narrow conception of self as this separate bounded object looking out for number one. As you say we’re talking a multi-generation transition here! I see it as a chicken and egg thing in the sense that the worldview/story stuff only matters/makes a difference to the extent it informs the way we actually are in shaping (and being shaped by) the world, and that it will only change via a fluidly iterative process where the action of designing/creating/modifying and the process of consciously untangling ourselves from no-longer appropriate mental models (and developing appropriate ones) will co-evolve together or not at all. But I certainly agree that conscious, collaborative inquiry into the holistic worldview without which permaculture don’t make no sense is as (if not more) important than looking into design process itself. In the end I see it as all the same thing I suppose. That said diving right into the world view stuff has got to be a bit intimidating in its scale and scope! Anyone game to leap into to that abyss will have my full moral support ;-). It would be wonderful indeed for permaculture and related approaches to eventually become redundant. Finally, you are the first person in my life (apart from my examiners) to mention having read something from my PhD! I had completely forgotten it even existed and I actually went back and went through that article and was surprised to find all the common threads with this latest project so thanks for the timely reminder. Wasn’t it! – yay for progress! ;-). I think the weak link is people! Everything in permaculture comes from people. The cultural climate, participants awareness, and their emotional maturity all can have serious impacts when carried forward into the design process. To use the language I’ve been working with on my blog, it’s a holon: the ethics are a subset of people/culture/awareness. They don’t exist without those things. Thanks Milton and yep us fallible humans sure can trip ourselves up with this stuff (and generally). Cheers for your thoughts. Also we’ll be going deep into holons in future posts – look forward to your feedback then! I wanted to voice one of the weaknesses I see in Permaculture at the moment, the issue of using (or more precisely not using) indigenous native vegetation in permaculture design. For me it fits in under a gap in the ‘Earth care’ ethic of permaculture and also under design process. I was fortunate enough to be able to discuss this issue at the Gippsland Permaculture Convergence last weekend with Adam Grubb who challenged my views on this issue and sent me away with some extra reading from David Holmgren on the topic. And while everything that was raised by Adam, and I read in David’s paper are very valid points, I am not completely convinced by the arguments. I first discovered permaculture through my interest in ecology and growing interest in personal sustainability. I remember reading the ethics and the broad overview of the idea of zones and being inspired by the feeling of hope. One of the key points that really resonated with me this idea of zone 5, wilderness. To me Permaculture was about creating human habitat in areas already disturbed by humanity and utilizing that land to be more productive while also being regenerative. Therefore, we wouldn’t need to clear more anymore native vegetation because we can produce more in the areas we already farm and live in. The problem I see now is that there are areas where biodiversity decline is so great that we cannot just rely on the areas that are left and even in areas where biodiversity is hanging on, I believe permaculture can further stabilise and promote (native) biodiversity gains as well as people care. I discuss this further later on. Permaculture places a big focus on utilising plants for multiple uses. A plant that is beneficial insect attracting, produces something edible and fixes nitrogen is viewed as more advantageous to have in the garden than a plant that only does one or two of those things. And this is where indigenous native species fall down in permaculture eyes. There are few natives that produce high quantities of ‘bush tucker’ and therefore most are overlooked by exotic species that offer more uses in human habitat. The argument made is that the more we can produce on our property, the less needs to be produced elsewhere on currently unsustainable farms and therefore, the less native vegetation that will need to be cleared ‘over there’ to feed us. It is seen that the amount of native vegetation we could possibly plant in our gardens will be less than needs to be cleared to produce our food in our current unsustainable farming practices. And I completely agree with this idea. And I should also state that I believe permaculture systems typically are (and should be by design) more biodiverse and provide more habitat for native species than a typical garden or lawn. But now I get to where I think there is a gap. 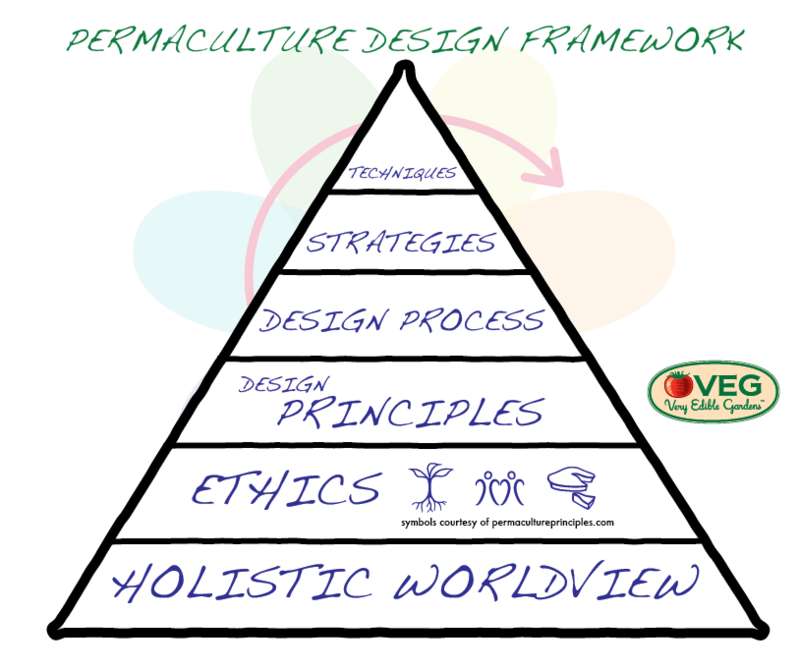 We look, as permaculture designers, across the landscape as part of our design process. We take into account climate, local weather, water movement across the landscape etc. And then we take all that landscape information and apply a design process to a box. The land within the boundary fence that we own. Logical? Maybe. We don’t own the land next door so we can’t directly influence it so why think about it in design if it doesn’t provide a shading, pollution or other impact to our property (or us to theirs)? And this is where, in a hostile matrix that is often neighbours ‘standard’ gardens, I think we can forget we are still part of a landscape and community. A community that one day will ideally implement a permaculture design themselves. I am not naïve enough to think that by planting a native garden I can reverse the decline in native biodiversity. But I do believe if I devote a small section of my property to native plant species, and everyone else in my community does, we can have a positive impact. The personal loss of produce from the area of native vegetation is reclaimed across the permaculture community through fair share of excess produce, the third principle of permaculture. There are many areas of the world where the native biodiversity is at such risk that we must rehabilitate the landscape if we want to preserve our unique biodiversity. And yes we could rehabilitate these areas with exotic species that directly benefit humanity but at what point do we balance earth care and people care? One example I will use is when I was told about exotic beneficial insect attracting plants, my first question was “well surely there are indigenous herbs etc that will bring in beneficial insects?” The response was, “probably, but you can eat the flowers from these exotic species in a salad so they have an extra use and are therefore desirable in most cases.” While that fits with what is widely taught in permaculture I couldn’t help but think, do humans need flowers in salads? I mean sure they look nice and have some nutritional value but has the permaculture movement become so human-centric that it’s willing to have a pretty salad in favour of habitat for indigenous insect species that promotes local biodiversity resilience? Does the gain from having edible flowers really outweigh the value of increased habitat and stability to local insect and flora biodiversity? I am a bird watcher by hobby and if there is one thing that I have learnt through countless hours of observation is that nature (native biodiversity) doesn’t need much to hang on. The fact we still have biodiversity after all humanity has done to the planet proves that it is resilient. The fact that we are still losing species out of our farming and urban areas shows how drastic an impact we are having. Permaculture was developed in response to this global threat. Get our own ‘human habitat’ in order to stabilise the collapse and then reverse it. I believe permaculture can help in this area of reversing biodiversity decline by taking a long term view of the landscape and world we want to live in but we need to work together as communities to make it a reality. This needs to start by looking outside the box of our property and at other local landscape biodiversity issues. If your property is an area where there are threatened species or community then shouldn’t it be a consideration of how you, in conjunction with the community (whether they join in now or later), can provide habitat for that species or at the very least not provide extra threats to the species, in your design process? I guess what has crystallised in my head as I have wrote this piece is that permaculture is taught by beginning with all the issues in the world, climate change, biodiversity collapse, pollution etc. And permaculture is held up as a way of thinking (and doing) that can help save and protect us from this dismal looking future. But aside from soil health (a major focus) a PDC is very human-centric by focusing so much on people care and through that fair share (between people) that I feel it is just assumed that if we look after the people and attend to our needs the rest of the earth care bit will take care of itself somewhere else in the background and we don’t need to worry about it. And I guess I am not convinced that is the case and believe that we need to and can do more to protect our biodiversity of which we all rely on if we work together thinking outside of our ‘boxes’. Thanks for your comment Brett lots of good thinking and questions albeit not directly relevant to my main point in this post as regards starting weak link analysis with design process. My thinking is your topic here more to do with both some of the foundations (ecological literacy, an wholistic approach or worldview, the earth care ethic) and with some of the applications that are generated by particular instances of design process. One question I’m left musing on is given that I know permaculuralists on every point in the continuum of preference for natives/exotics, whether permaculture needs a uniform stance on this or it is a region where a diversity of stances is actually a good thing. Anyways I’d like to think that down the track making permaculture stronger can return to address and explore these issues head on (but at this stage will be a fair way down the track). Possibly we could move or copy your comment at that stage and use it to help stimulate the discussion! So interesting to see how you’re approaching this. Lots of resonances with a current project of mine, which is elaborating a framework research agenda for permaculture. I’ll post about that soon. Keep up the good work! Thanks Rafter! I can’t tell you how much I love and respect your work and I’m feeling the resonances too, trust me. Look forward to your research agenda post and to staying in touch as the space of this wider conversation evolves.